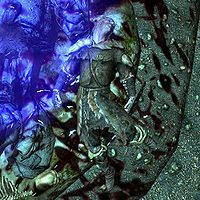 Vidgrod is a dead Nord bandit found in the first part of Halldir's Cairn. His body is found with his dead friends, Agrius and Raen, next to the cairn with magical energies flowing out of it. He has a random weapon and may have a shield. According to Agrius's Journal he and his friends were kicked out of a bandit gang and took refuge in Halldir's Cairn, where they were possessed by Halldir and killed themselves, giving their power to him. Vidgrod's body, along with his two friends, is consumed by Halldir to make his three elemental copies during your fight with him. This page was last modified on 15 May 2017, at 22:23.